Popping in today with a recipe just in time for – you may have guessed it – the Super Bowl! Last year I took a look at the history behind the ever-popular buffalo wings, and how the heck they got their name. 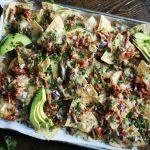 This year for the big game day I decided to share a recipe that can feed a hungry crowd, made on one sheet pan: loaded pulled pork nachos. 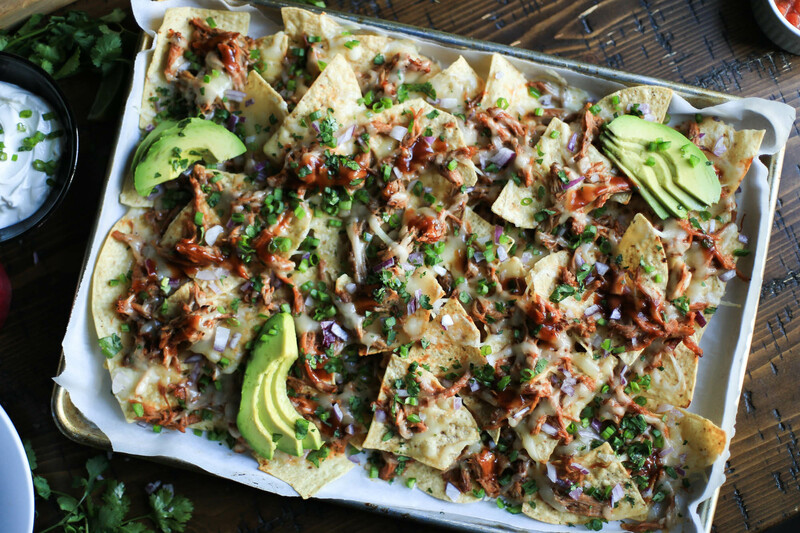 These nachos come down to three basic steps: Make pulled pork. Assemble nachos. Eat and eat and eat. 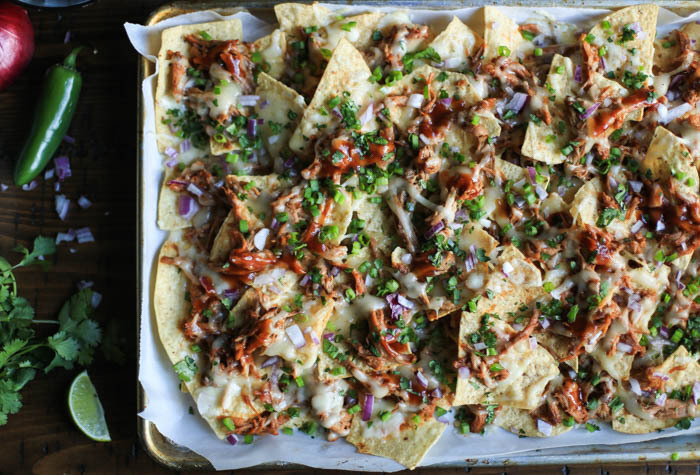 Sheet pan nachos are wonderful party food for serving a lot of people. So this could be for the Super Bowl, or, you know….dinner for the family on a Tuesday. 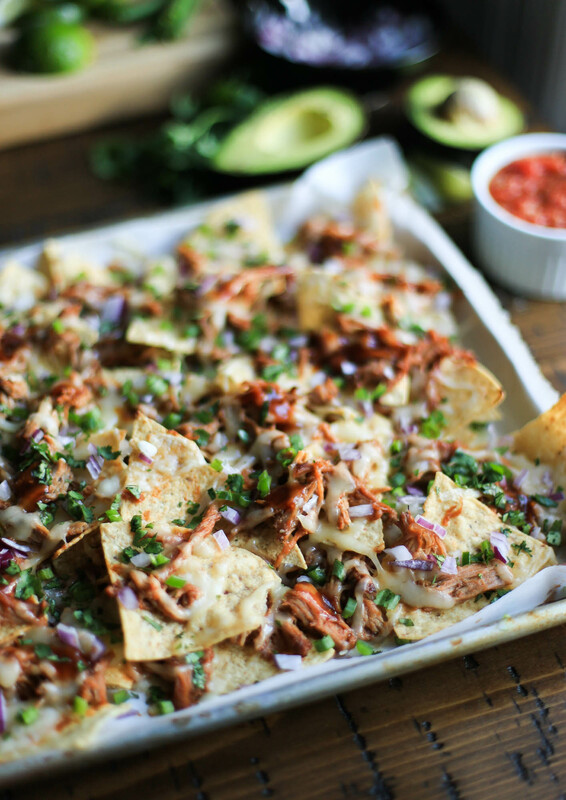 Let the pork cook all day (or even the day before) and then by game time you can simply put together some nachos. This recipe is a considerable upgrade from those round nachos with bright orange cheese, served in a plastic container, that I used to eat endlessly at middle school sports games. Chips and cheese are something I will always love, though now I’ve taken nachos to the next level, and I’m not sure I can ever go back because these are JUST SO GOOD. Quickly sear the meat before throwing it in the crock pot. Don’t skimp out on this step, you KNOW it gives the meat a whole lotta flavor. Also, I really love chipotle. So I decided to mix it with a bit of BBQ sauce for added flavor in the slow cooker, and the results were wonderfully smoky and a bit spicy and, just do it, okay? One option is to make the pulled pork the day before – it can take 6-8 hours in the slow cooker. 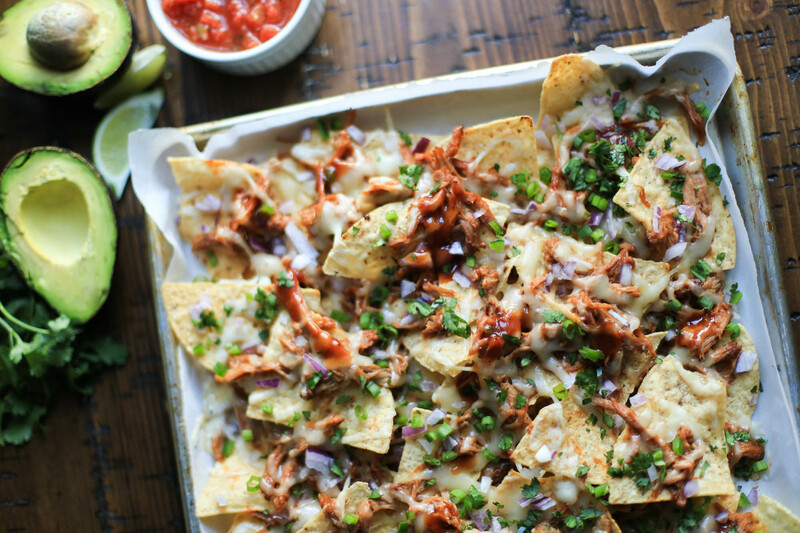 That night, you can enjoy pulled pork sandwiches for dinner, and the next day still have enough to assemble some really freaking delicious nachos too. Booyah. Don’t dump all that liquid left over in the crock pot. Instead, reduce the liquid on the stove (to thicken) and strain it. Mix a little with BBQ sauce, and you’ve made a stellar SUPER sauce that can further flavor the pork, and also drizzle straight on the nachos. If you have the time, shred your own cheese. Besides avoiding additives that go into pre-shredded cheese, freshly shredded cheese melts on the nachos much better. 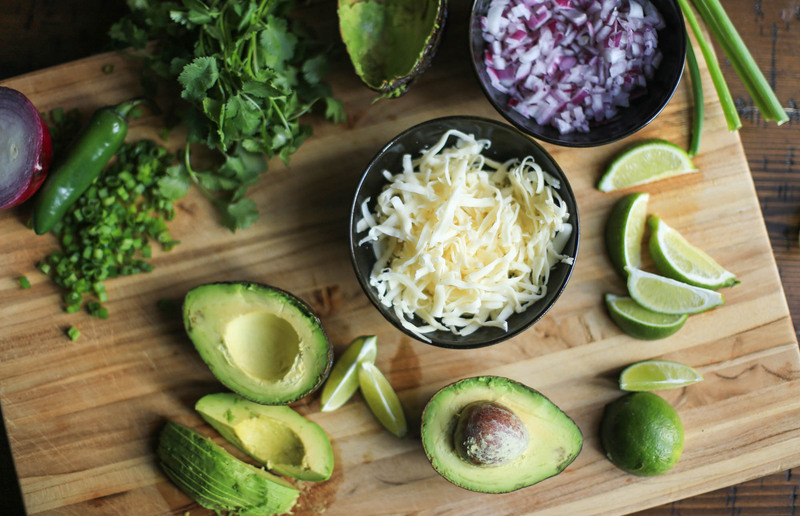 Want a healthier recipe? Use sweet potato chips and cut out some of the cheese. Toppings are easily personalized, so if you really love black olives (though I have yet to meet a person that does) you can throw ’em on there. If it’s just two people, I recommend only making half a sheet pan of nachos. My husband and I tried to conquer the full-sheet-pan challenge and failed. Just go halfsies. Other than that, I have to say that sitting down to enjoy the assembled pulled pork nachos while watching some TV, whether it be football or figure skating (Olympics soon! YAAS) is a meal well-earned. Layers of the crunchy chips, gooey cheese, and BBQ pulled pork, loaded with all the toppings, completes one epic plate of nachos. To make the pulled pork: In a small bowl, mix together the salt, pepper, oregano, and cumin. Rub onto the pork. Heat the olive oil in a large skillet over medium-high heat. Sear the pork to brown it on all sides. Remove it and place in the slow cooker. Add the diced onion to the skillet and saute for 4-5 minutes until soft. Add the sauteed onions to the slow cooker, followed by the chopped chipotle peppers. Whisk together the broth, adobo sauce, and BBQ sauce and pour over the pork. Cover and cook on high heat for 6-8 hours or until the pork is tender and shreds easily with a fork. Use two forks to shred the pork and discard any fat. If desired, reduce any leftover liquid (from the crockpot) by simmering it on the stove. Mix 1/2 - 1 cup of the reduced broth, strained, with the pulled pork for more flavor. To make the nachos: Preheat the oven to 400 degrees F. Line a baking sheet with parchment paper. Place a layer of chips in the pan to fully cover the bottom of the baking sheet. Top with desired amount of pulled pork and cheese. Then add one more layer of chips, followed by pork and cheese. Bake for 5-10 minutes until the cheese is melted. Remove the pan from the oven. Sprinkle on the red onion and jalapeno, along with any other toppings you desire! I recommend serving salsa, sour cream, and/or guacamole on the side. If you like very cheesy nachos, you might want to shred a full 16 oz. of monterey jack. Feel free to use any kind of pulled pork you like!